Thunder Bay is dedicated to revitalizing its spaces with good architecture, especially along its historic port and downtown. With the second phase of the Waterfront development underway, it’s easy to see how the community is reacting to these thoughtfully designed spaces. With the help of local architecture firms and consultants, Thunder Bay is successfully building more than just community spaces; it’s fostering its residents, honouring its history and stimulating its local economy. 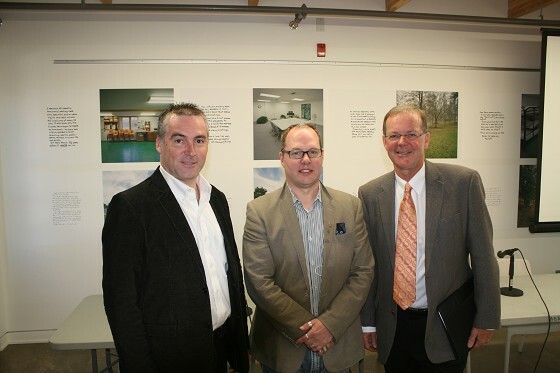 The Ontario Association of Architects and the Thunder Bay Chamber of Commerce hosted an event called “Architecture is an Economic Driver” on Wednesday, September 30 . Toon Dreessen is Ontario Association of Architects President He works as a Architect in Ottawa, studied at Carlton University and started working in 2006. In Ontario there are currently 3700 Architects. This is an interesting event today for Thunder Bay? What is your impression of Thunder Bay? “ Thunder has a vibrant arts and cultural scene, great restaurants, beautiful new buildings, older buildings, condos and other space ready for future development that is phased in. This provides a long term sustained growth for the community. The city can lead that with goals and targets with elements like the skating rink. How can architects help a city grow? Do you think Thunder Bay has good potential? box or similar buildings. It should be Thunder Bay. At the waterfront I see beautiful buildings that are unique in a sense to Thunder Bay. It is an informed sense of value and culture. There is quite a long training period to become an architect? Cory Stechyshyn is President of i4architecture and NWOSA Chair.